James, born on December 4, 1803, was the youngest son of Alexander and Jane (Scott) Fraser, tenant farmers in Dryburn Farm, Moray, Scotland, about one and a half miles from Portgordon. He had eight siblings: an older brother Alexander (1802-1809) Isabel (3 years his junior), John (a "sawyer" who married Margaret Innes), Margaret (1810-1813), another Margaret (1817 who married master carpenter James Reid), Mary (who married Captain Alexander Hendry, a sailor lost at sea off Troup's Head), another Alexander (who married Ann Geddes and continued to farm Dryburn), and Andrew (1821). James acknowledged fathering a child (William Fraser) by Ann Green in 1839. However he and Ann never married and their son William was raised by Ann's parents Alexander and Margaret (Milne) Green of Slackend Farm. 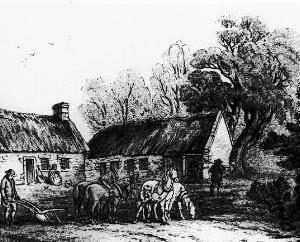 Ann, later married William Simpson a blacksmith at Longhill, Urquhart Parish in Morayshire. Together Ann and William Simpson had 4 half siblings to William (Ann, Mary, Isabella and Alexander Simpson). James had a varied career in the town of Portgordon. He was harbour master, fish-curer, merchant, grocer, grain-dealer and finally (together with his older sister Isobel) innkeeper of the Portgordon Inn. After James death, Isobel carried on his grocery business for another decade. She may, at that point, have turned it over to her younger sister Margaret who is also listed as a grocer in the town of Portgordon. With regard to the village of Port Gordon itself, in trying to locate the original site of the Port Gordon Inn it would appear that at one point in the 19th century there were at least 10 such establishments!! Given that the current population cannot be above the 800 mark, it seemed unbelievable. But I had underestimated just how much of a boom town Port Gordon really was. The village with its harbour had been built in 1797, commissioned by the 4th Duke of Gordon. Its main function was to provide a shipping depot for the grain produced by the Duke himself and his many tenant farmers. So the Frasers would have found themselves in the ideal location to set themselves up as grain merchants. The same is also true of Inn keeping and shopkeeping etc. The village would have become a hive of industry. With the coming and goings of cargo ships, ship wrights, farmers, grain merchants and fishermen working out of the new safe berthing provided by the harbour and so on. So there would have been considerable potential opportunities for any budding entrepreneur. However, being dependent on the state of local agriculture and later the state of the local fishing industry, it would have experienced its fair share of recession. I think this could explain the diversity of James Fraser's business interests. The mid 1840's would have been a particular low point with a succession of bad harvests sweeping throughout Europe (including the notorious Irish potato famine) In 1847 armed soldiers had to be put onto the streets of Portgordon to keep order. I believe that a local grain-dealer, acting on the orders of the Duke, had been alleged to be stockpiling the local meager supplies of grain in order to export it at grossly inflated prices. Some locals fearful that this could precipitate famine in the region, took to the streets with a view to besieging the dealer's house and taking his family hostage. Somehow, our James, with his "strict probity..", seems an unlikely candidate for such a colourful act. THE SCHOOL MASTER OF RATHVEN, BANFFSHIRE, in the ABERDEEN CHRONICLE, April 20, 1814, a report that two fishermen at Portgordon, about a mile west of Buckie, whose character he was able to vouch for, were returning from fishing in Sprey Bay; 'about three or four o'clock yesterday afternoon, when about a quarter of a mile from the shore, the sea being perfectly calm, they observed, at a small distance from their boat, with its back turned towards them, and half its body above the water, a creature of a tawny colour, appearing like a man sitting, with his body half bent. Surprised at this they approached towards him, till they came within a few yards, when the noise made by the boat occasioned the creature to turn about, which gave the men a better opportunity of observing him. His countenance was swarthy, his hair short and curled, of a colour between a green and a grey: he had small eyes, a flat nose, his mouth was large, and his arms of an extraordinary length. Above the waist, he was shaped like a man, but as the water was clear my informants could perceive that from the waist downwards, his body tapered considerably or, as they expressed it, like a large fish without scales but could not see the extremity.' But this was not the end of their encounter for he dived and surfaced some distance away and was not alone. With him was what appeared to be a female of his species for she had breasts and hair that reached past her shoulders. The two men then rowed as fast as they could to land where they related their story to the school master. "....we take up pen to record the death of one who, for the last 30 years, has been closely associated with the trade and business of our village. Mr. James Fraser, Innkeeper, merchant, and grain-dealer, met with an accident in November last, by which he has been ever since, but for short intervals, confined to bed and which, acting on a weakened consitutuion, resulted in his death on the forenoon of Friday last. For three decades Mr. Fraser has occupied a prominent position in Portgordon....and....deservedly obtained the respect of all, and they with him in business transactions. The deceased was more especially remarkable for his straightforward character and the strict probity, punctuality and exactness which characterized all his dealings. A blunt manner of address concealed a good and generous disposition, and many, very many friends both in town and country, will not forget the frank and kindly greetings of the late James Fraser." As a result of his accident, James was struck blind for the last few months of his life. When he completed his will he had to dictate it to a notary and indicate his acceptance of the will's terms by verbally swearing in front of witnesses and by touching his hand to the notary's pen. As a grocer, over one hundred residents of Portgordon were left owing him money (usually very small sums) at the time of this death. He died September 10, 1869 at 65 years of age. For more on the Portgordon area where James lived see the biography of Ann Green Simpson.